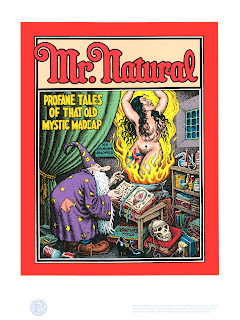 The Official R.Crumb Site is pleased to announce the release of our next giclee edition: Mr. Natural Conjures The Devil Girl. This hand-numbered limited edition of 300 giclee prints will be available May 15th. The new edition is based upon the front cover of The Profane Tales of Mr. Natural, with several slight color changes. The image size is 14 x 18 inches. The white Somerset Velvet archival paper is 18 x 24 inches. All Crumb giclees are printed with archival, brilliant Ultrachrome inks by Epson. Price is $80 each. Every print is sold with our unconditional guarantee for your complete satisfaction. We are now beginning work on our next serigraph edition, and will post step-by-step details of the entire project as it evolves. You can read about The Blues Project on the Official R.Crumb Site.